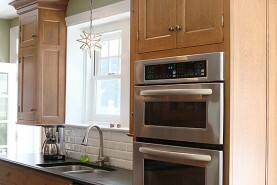 Fusing three complementary styles into one kitchen, this project allows a large space to feel intimate. In keeping with the Early 20th Century architecture of this home, this traditional kitchen reflects the look and feel of the original staffed kitchen. 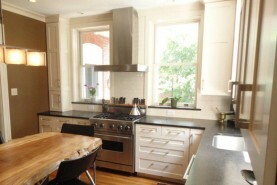 This renovated 19th Century city home kitchen is built for two food/cooking enthusiasts and has been configured for entertaining while cooking. 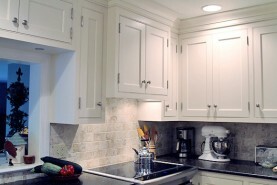 There are over 35 concealed pull-out drawers for specialty storage. 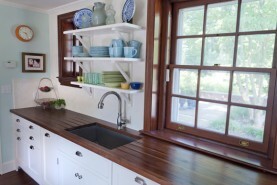 This minimalist kitchen in Chester County is constructed from quarter sawn Sapele Mahogany. The cabinetry is touch-latch with no exposed hardware and has pillowed edges and has a modern feel to match the architecture of the home. The cabinetry in this reproduction post and beam barn includes a combination of simple Shaker and traditional 18th century raised panels with pegged joinery in American black walnut and quarter-sawn white oak. The unique island legs are made from honey locust cider press screws reclaimed from an old Chester County PA farm. This simple, everyday kitchen design posed a challenge because of the numerous entry ways, windows, and limited square footage. Features include flat-panel beaded drawers with exposed, mortised hinges, large cove moldings, beaded back splash, and arched end panels. 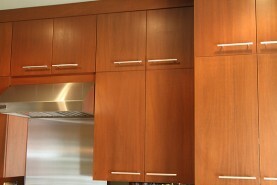 Stained African mahogany veneer lends a warm metropolitan feeling to this city townhouse kitchen. The dovetailed maple drawers are mounted on concealed, under-mounted drawer slides. With its extensive paneled ends and back splashes in stained, quarter-sawn white oak, this kitchen marries 19th century and American Craftsman styles in perfect complement to the style of the home. 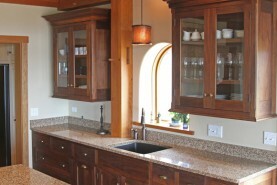 Subtle in its details, this extensive cabinetry mirrors the Arcadian architectural style of the home. 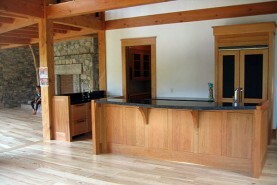 Cabinetry and millwork in natural Pennsylvania black cherry can be found throughout the kitchen, bathrooms, offices, and open spaces of the home. 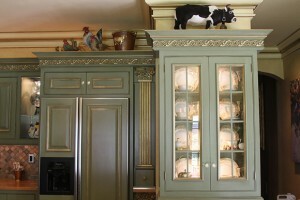 This historic Lancaster, Pennsylvania home boasts a grand and elegant kitchen with exquisite 17th century French architectural detail. 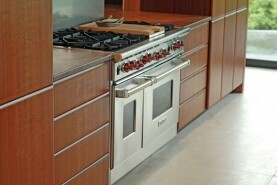 Cabinetry features extensive hidden pull-outs and disguised appliances with hand-applied, glazed gold leaf.